The book explains everything important about computers -- simply, candidly, and as wisely as possible, with a cynical laugh and a peppy pace to save you time. Previous editions of this book were rated "tops" by the major computer magazines, newspapers, library organizations, schools, and computer clubs worldwide. The reader will become familiar with agencies and projects related to the deployment of Free Software in the public and private sectors, and will learn to identify and understand the consequences of the use of Free Software in different areas. In addition to covering a history of free and open source, The Daemon, the Gnu, and the Penguin explores how free and open software is changing the world. 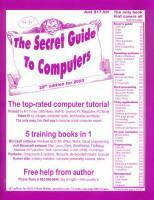 It is authored by Peter Salus, a noted UNIX, open source, and Internet historian and author.